Look around. Digital disruption is on a tear! The new business models are heavily dependent on technology for delivering products and services. In fact, digital transformation is the main catalyst for extraordinary change in most companies, challenging everyone’s ability to keep pace. For those that were hoping for some respite, the velocity of technology change is only getting faster. Since technology leaders are the impetus for most of this change, they are also blamed for too much too fast, leading to change fatigue in their companies. CIOs are struggling with the number of changes that they need to implement. In fact, according to Gartner, 64% of CIOs expect their very role to evolve into change leaders. Many are sensing the rolling eyes of their colleagues on them, as they bring in yet another technology change to which everyone must now adapt. Under the best of circumstances, leading change is a high-risk and low probability proposition. Only 34% of changes are successes, 16% are partial successes, and 50% are abject failures (Gartner). Thus, in many organizations, the skepticism associated with more changes is reaching a crescendo, as the benefits from such digital transformation efforts do not seem to materialize. The sad truth is that most IT leaders are not well versed in change management techniques. Many are mystified by the resistance they encounter as they bring in all the “wonderful” technology into the enterprise. Unless, CIOs recognize their role as change triggers – and begin to manage that change – failure is likely. As we move to cloud-based platforms – and Everything-as-a-Service models – changes are no longer occurring once a year or quarter, as they used to occur in the past. Today, vendors make changes to their solutions often – sometimes many times in a single day! The technology environment you walk into when you come to work may not be the same one you leave at the end of the day. Solutions, functionalities, fixes etc. are flowing in and out all day….. In these fast moving rapids, CIOs need to become masters of change and understand the nuances of change management. Otherwise, the speed of digital transformation is likely to consume all their efforts in a losing cause. At the October 2018 Gartner Symposium in Orlando – one of the largest gatherings of CIOs – Change and Culture were two of the main themes. Gartner even coined a new paradigm that they call ContinuousNext. Here, the gaps that once allowed us to assimilate and consolidate before moving to the next change – have vanished! We are now in a perpetual, high-velocity change cycle, and ContinuousNext seeks to position organizations to foster perpetual innovation, change, integration and delivery. In 2018, an astonishing 62% of companies have a major digital transformation project underway. This is the new paradigm. As a result, Change Elasticity for the ordinary user or customer may soon be at a breaking point. At a keynote at the Symposium, Ginni Rometty, the IBM CEO, confessed that managing change remains one of her highest priorities and one of her biggest challenges. Change programs inevitably lead to changes in the company culture. In fact, 46% of CIOs consider culture as the biggest barrier to scale digital business transformation. How you transform, and what kind of culture you create, is now what leaders like Jeff Bezos and Rometty focus on. To them, creating an agile culture capable of rapid change, is not only a prerequisite for future success, but it is the key to survival. “The Vision” is the critical groundwork for any change project. It requires developing a consistent, rational and “shared” change story that everyone understands. Recognize that whereas you may have spent weeks and months on transformation issues, employees have no such context. They need time and repetition to become steeped in the new vision. You may have to pause many times, before you can go faster. Set the general direction, not the destination. Destinations invariably change. Unless everyone aligns with the change story, success is difficult. Work with key influencers who can form the informal network to diffuse the key elements of the story throughout the company. Most of us respond best when we can acknowledge the present and the future state. Thus, be clear about what needs changing, and to what? For example, we need to move from being right the first time to learning to fail fast. Can you create a safe to fail testbed in your company? Avoid using “enterprise speak” which is vague and abstract. Don’t forget to emphasize what is working and needs to remain. Make sure that everyone knows where to begin and how the company will help them in making the transition. 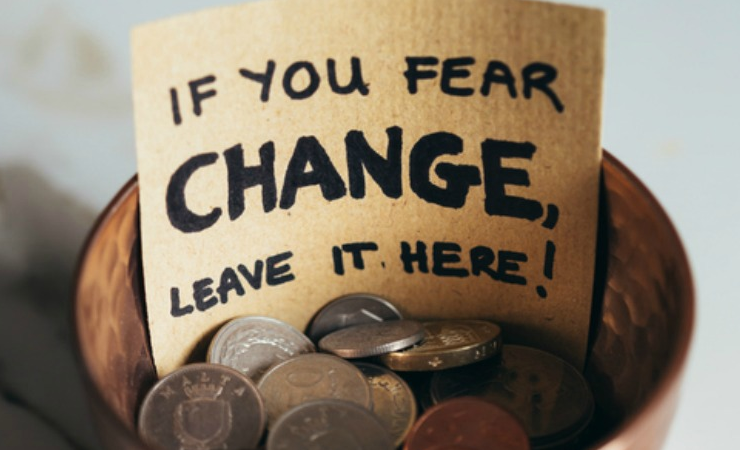 Change creates fear and anxiety. In the extreme, it deflates morale and kills productivity. Co-creation creates buy-in and is the secret-sauce for lasting change. Empower staff to feel in control of their own destinies and to determine what kinds of behavior changes they will need to make, and you have a foundation for organic change. Listening carefully and openly is necessary for buy-in. You may even be surprised by the questions of the employees. The goal should be to move the organization from the angst associated with “one more change is coming” to the excitement of experiential learning, where the latter becomes a perpetual activity and gets ingrained into the organizational culture to become an accelerator of change. Cross-functional, diverse teams tend to co-create far better than monolithic groups because they are already adapting at a high level. Listen to the employees. Ask them what they think is likely to impede the transformation and address the shortfalls. Often, process changes must go together with behavior changes in order to be successful. And yes, make sure that budgets and resources are available to make this work. Employees must know the program’s communication cadence, and who they can go to for clarity. Make sure that a “master” of the change plan is available to all staff. This will prevent conflicting narratives. Great communicators are sensitive to different audiences and calibrate the messaging to be most effective. Prioritization, with tangible outcomes, helps create a clear vision as well as helps manage the pace of change. Focusing first on customers and their outcomes is one way to rank transformation tasks. Another way to prioritize is to look at quick wins first and create a momentum shift before taking on the more complex phases of change. Calibrate change efforts to different groups of stakeholders. Changing behaviors is not easy. Don’t be too quick to label employees resistors. Recognize that what you may see as change resistance may be an individual’s unique absorption pace. New behaviors and core skills take time to establish. Embracing change and uncertainty is not in our nature – yet, that is what is required of all of us. Change elasticity must be built as a core skill. Provide the training opportunities to help employees shift to the needs of the transformed organization. In the current environment, speed and agility are some of the most important markers for relevance. How you change, is just as important as what you change. The very nature of digitization and change at this pace means that even the most proficient among us, will be challenged. CIOs need to recognize this. To take advantage of the opportunities, we all must get a little more uncomfortable with the status quo and more comfortable with uncertainty related to change.